In Japan all bonsai are grown outdoors, therefore cold hardy trees are considered traditional bonsai, and we have grown them for over thirty five years. Our huge collection of trees ranges from the smallest gem to 100-year-old refined third-generation specimens for your collection. They range from deciduous trees such as Japanese maples and Chinese elms to conifers such as pines and junipers, and you will find thousands to browse among. Since these trees go dormant in the winter time, they are never grown indoors. We keep our trees outdoors through the end of November and overwinter them in several growing facilities, protecting them from the damaging winter temperatures. Most of these trees are back outdoors before the end of April and as bonsai growers we anticipate the new growing season every year with great joy. 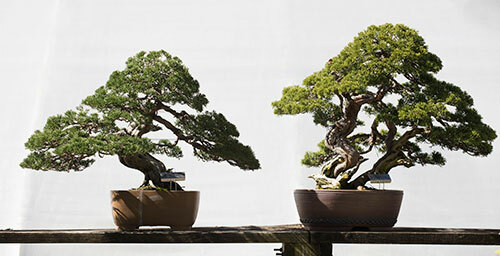 Whether you love bonsai for the shapes and styles, the color and texture, or the daily interaction with your trees in the outdoors, it is the cold hardy trees, with their early spring buds and lush colorful fall foliage that capture the essence of bonsai. Read about our Winter Boarding.